Scientists at the UK's Institute of Cancer Research have prevented breast cancer spreading to other organs in mice by blocking a chemical. In their experiments, they showed that blocking the enzyme LOXL2 prevented metastasis. They said their findings, published in Cancer Research, provided a "fantastic drug target" and were "highly likely" to be used in a clinical setting. Cancer charities say the research shows great promise. 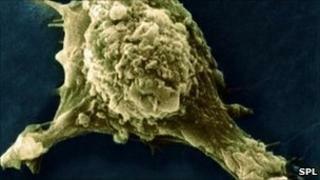 The authors of the report say 90% of cancer deaths are due to tumours migrating around the body. When they looked at patients with breast cancer, they showed that high levels of the enzyme LOXL2 were linked with cancer spread and poor survival rates. They also showed that LOXL2 was important in the early stages of cancer spread. It helps cancerous cells escape from the breast tissue and get into the bloodstream. In their studies on mice, they used chemicals and antibodies to block the activity of LOXL2. This stopped breast cancer spreading to other tissues. Dr Janine Erler, team leader at the Institute of Cancer Research, said: "LOXL2 is a fantastic drug target, it's highly likely to be used in a clinical setting." She said the findings were not just important for drug development, but also for developing a test which can predict the likelihood of cancer spreading and as a result, patient outcomes. Arlene Wilkie, Director of Research and Policy at Breast Cancer Campaign, which funded the study with the ICR and Cancer Research UK, said: "Dr Erler's results are very exciting, as although currently we can treat breast cancer that has spread, we cannot cure it. "By using LOXL2 to predict whose cancer will spread and drugs to block the enzyme to stop this from happening, many more lives could be saved. This laboratory research shows great promise and we look forward to seeing how it translates into patients." Dr Julie Sharp, senior science information manager at Cancer Research UK, said: "Cancer spread is an important problem in breast and other cancers, and scientists are searching to find new ways to stop cancer spread and save many more lives. "The team have shown that targeting the molecule LOXL2, which plays a key role in spread, could offer new approaches to tackle this problem."